Winter is finally loosening its grip, and with the warm weather in the Brooks Range, the Colville River next to our home has started the first stages of breakup. The start of breakup for us is the flooding of the shallow parts of the river where the ice has frozen down to the river bottom during the winter. 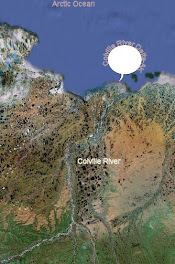 This “overflow” occurs as the water pressure from up-river continues to increase and the channel ice over the deeper parts of the river lifts up. The ice needs to lift up between two and half and three feet before it will crack and let the water flow out over the frozen-down areas. Clear brackish water boiling out of a blowhole. Some of the shore leads created at this time can be over a half mile wide. 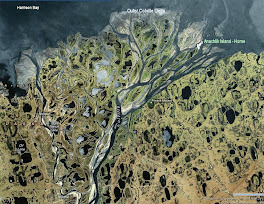 Since the Colville has very little flow in the winter, the delta fills with brackish water from the Arctic Ocean during the winter months and the first water to flow up on the ice is clear greenish-blue color. It usually take from 1-2 days to flush the brackish water out of the delta after which the water becomes a dirty brown. Then it usually takes another week for the ice to weaken enough to break up and move out into the ocean. Dark waters are shore leads, white channel ice over the deep water. During the last wind storm, just before the river flooded, we had a special treat when a female Muskox and her calf showed up and spent four days in our local area. During the first two days they were here, it was storming so hard it was difficult to see them in the blowing snow. When they were lying down they were quickly covered with snow and blended in even more. When the storm broke, the cow and calf continued making their way to the west and were on an island west of us when the river flooded. Upper photo shows female Muskox with snow packed in her pelt. Bottom photo was taken two days later, still whiteout but the wind has died down and they are enjoying a warmer day. With our cold spring and heavy snow cover, the waterfowl were happy to see the river flood, and many White-fronted Geese and Brant were seen out bathing in flood water. Even with a few days of warm weather and melting during the day, the ground is nearly 95% snow covered, with only the higher polygon ridges and grass tussocks melted out. The number of birds around our feeders at one time has started to decline, as birds pair up and move out onto their nesting territories. Our Lapland Longspur numbers peaked at around 150 during some of the worst parts of last week’s snow storm, and now we might see 15-20 at one time, with many birds shifting in and out of the feeders. The Brant are our most numerous species now, with over 600 within sight of the house, either feeding along the river- banks or staking out nest sites in the nesting colonies. With this many Brant here already we should have an early hatch this year. May came in on a strong wind and it has continued on the windy side with 12 of the first 19 days having winds of 20 knots or more. Besides being windy, most days have been overcast with blowing snow, creating many whiteout days. Today we are into "day four" of the latest wind storm, with visibility less than a mile in blowing snow and mist. The temperature over the past 24 hours has been pretty steady with a low of +26F and a high of +28F. With all the drifting snow and temperatures below freezing the tundra is still 100% snow covered and almost no grass above snow level. Despite the storms, birds have been working their way north. The southern part of Alaska has been having very warm temperatures and it looks like this has prompted some birds to continue north sooner than they should have. The worst species to be hit hard (that we know about at this time) are some of the eiders. We started finding King and Common Eiders weak and dying as early as the12th of May, and most have been females. Perhaps these are birds that were migrating on east to northern Canada, but ran out of body reserves and perished in our area. We wouldn’t expect King Eiders that are going to nest in the Colville Delta to arrive before the last couple days of this month or first few days of June. Roosting Willow Ptarmigan-Male just starting to get summer feathers on its neck and head. Here on the homestead our first migratory birds (Snow Buntings) returned on the 17th of April as I reported in “They’re Back” in April’s blog. Earlier this month some of our Willow Ptarmigan showed up around the house, even roosting outside our bedroom window for a couple nights. Short-eared Owl that passed through the yard in the early morning hours. Today even with this wind we have had six new species arrive: a Savannah Sparrow, White-crowned Sparrow, Lapland Longspur, Hoary Redpoll, Short-eared Owl and a Sanderling. Only the owl and Sanderling kept going, the others were happy to find food and shelter out of the storm, joining our Snow Buntings and Ruddy Turnstones at the feeders. The Savannah Sparrow and some of the female Longspurs seem quite weak and after eating from the feeders, took quick naps before going back to refuel on more seed. Sparrow preening after eating, getting ice off its feathers. For most of these species, this is an early arrival date, some by over a week. Also, we would expect to have only male longspurs, in the beginning, with the females trailing 4-5 days behind them. Today we have 6 females and only one male at the feeder. As hungry as these birds have been, it makes me wonder about all the ones that didn't find our place with shelter and food and how many will perish from this late spring storm. Combine this with the many birds coming north too soon, and it is a sad picture of many lost birds.